Remember the days of health nuts eating wheat bran for breakfast? Well, healthy living just got a whole lot tastier thanks to researchers at the University of North Carolina. A tip of the snout to John Shelton Reed, who alerted us to this article on the Republic of Bacon website. The article reports on a study published in the FASEB Journal showing that choline is important for the brain development of fetuses. What foods are high in choline? Well, bacon for one. Thus, pregnant women may benefit from eating bacon and other choline-rich foods. If you must consume pork while driving, I find that it is much safer to eat a tender BBQ sandwich, though the dripping sauce and grease can make it difficult to grip the wheel. It distracts from the obvious fact that as a culture we eat too much and exercise too little. Until we resolve those issues, everything else is fairly irrelevant. It implies that the pure enjoyment of food is suspect, that there must be some practical benefit in every bite we eat. This is antithetical to the enjoyment of food and, at the risk of being overly dramatic, to human nature. It puts an emphasis on “health” over quality. Are we supposed to eat lousy, lazy oven-cooked ribs with a mass produced, highly processed yet antioxidant-rich sauce and feel good about ourselves? And should we feel bad about eating a wood-cooked, presumably carcinogen-tainted plate of chopped pork covered in homemade but low antioxidant sauce? Nonsense. Maybe I am overreacting, since that’s what I do when inhabiting my Porky LeSwine persona, but this sort of madness needs to stop. Eat a balanced diet, run around the yard with your kids every chance you get, and by all means enjoy your BBQ sandwich. A North Carolina company is following in Toyota’s footsteps with a massive recall of a life endangering product. In this case, the recall has nothing to do with defective gas pedals and isn’t actually that massive. According to this article, The Murphy House of Louisburg is recalling roughly 2,850 pounds of pork barbecue. The company’s pre-packaged five-pound buckets o’ ‘cue “may contain an undeclared allergen, soy flour,” according to findings by the U.S. Department of Agriculture’s Food Safety and Inspection Service. Consider this recall further proof that soy has no business within 25 yards of barbecue. 2009 brought us the aporkalypse. No, not the continued advance of gas-cooked barbecue, but the fear-mongering stemming from the ill-named swine flu. Because really, what did swine, and by extension barbecue, ever do to deserve so much hatred? Undue worry in response to swine flu. Includes unnecessary acts like removing nonessential kisses from Mexican telenovelas and the mass slaughter of pigs in Egypt. I’m against undue fear in all forms, but especially when it prevents telenovela smooching. And anything that threatens my barbecue and, by the (delusionary) commutative property, my livelihood. I’m not, however, against a little humor surrounding this topic. 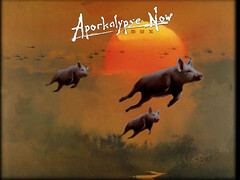 Then again, if there’s any truth behind Aporkalypse Now–the online game–maybe the fear isn’t so unnecessary. Be afraid of anthropomorphic zombie pigs wearing suits. Be verrry afraid.